Whether you need products for commercial use or residential use, Hohulin Fence offers the exceptional fence installation Bloomington IL needs. 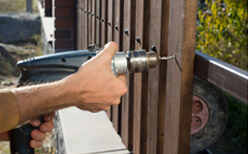 Here at Hohulin Fence, we always adhere to best practices and hire only the most skilled contractors around. Our proven process is seamless and stress-free, which is why you can count on us to provide top-notch levels of satisfaction and service. This is what makes us a leading fencing industry expert throughout Bloomington and beyond. In fact, we’ve been local leaders in fencing since 1897. 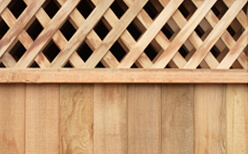 Schedule on-site fence estimate: We visit your home or business to speak about your needs and give you a free quote. Our team can show up whenever it is convenient to you, whether after hours or on the weekends. Sign and return contract with deposit: After reviewing the terms, you will sign the contract and send it back to us. Make sure to include a deposit of 50 percent down. We accept cash, check or credit cards. Obtain permits: When applying for a fence permit from Bloomington, you must provide a copy of the contract in order to process it. Plus, you should get permission from a neighbor or homeowner association about fence placement if you need it. Schedule installation: After confirming the deposit and ordering materials, we will add you to our schedule rotation. While we can give you a ball park estimate of when we will arrive, we can’t say with certainty. That’s because it depends greatly on material availability and the time of year. Prepare the jobsite: While we ensure marking for public utilities, you must advise us on the exact location of sprinkler systems, sump pumps and lighting when it comes to private utilities located on your property. Installation job: If you are able, we would prefer you be on site for the job, at least during the first couple of hours of installation. This is so you can walk through the layout with our installers. Please note, all jobs are subject to weather conditions. To learn more about the fences we install in Bloomington IL, contact us at 309-316-1008. Additionally, you can email us at info@hohulinfence.com. We are located at 116 South Harrison Street in Goodfield, IL for your convenience.